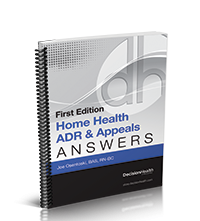 Home Health ADR & Appeals Answers, First Edition, will walk you through how to respond to ADRs, and how to appeal when necessary. So you think your documentation is audit proof, but ADRs are coming in and RACs are knocking on your door – now what? Home Health ADR & Appeals Answers, First Edition, will walk you through how to respond to ADRs, and how to appeal when necessary. Gleaned from experience with thousands of ADRs and appeals and hundreds of ALJ hearings, home health reimbursement recovery & appeals expert Joe Osentoski BAS, RN-BC shares his approach, which extensively integrates applicable Medicare rules and regulations to explain what is happening, what should be happening, and how to apply these in the Medicare review and appeal process. Author Joe Osentoski, BAS, RN-BC is the Reimbursement Recovery and Appeals Director at QIRT.